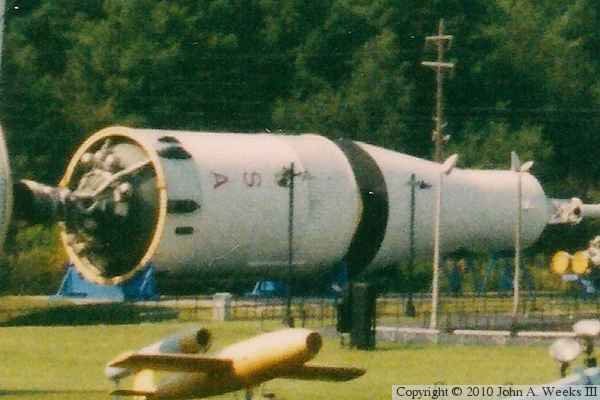 This is the 3rd stage booster of the Saturn V rocket on display at the US Space & Rocket Center on the grounds of the Marshall Space Center near Huntsville, Alabama. It is displayed with the cargo fairing, service module, command module, and escape tower that would have been typical of an Apollo stack configuration. This stage has the -D in its designation indicating that it is a full scale development article intended to be used in testing. As a result, it was not given a vehicle number. This rocket stage was on outdoor display for many years. It deteriorated very badly. Public outcry lead to it being restored and moved into a purpose built structure in July, 2006. This photo is scanned from a 4x6 print that I took in 2004. I apparently didn't take a photo of this specific rocket stage during my visit, but I found this view of the rocket stage in the background of another photo. I cropped that part of the scan and enlarged it resulting in this image. It is a nice view of the artifact, but the image is somewhat grainy as a result.